Good news is that drinking beer doesn’t damage your kidneys, even it makes them healthier. While other alcoholic beverages damage the kidneys badly. In fact, the risk of developing kidney stones is reduced by 40% on drinking each bottle of beer. 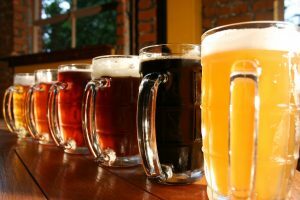 Each 30 cl glass of a beer, especially dark beer, has up to one gram of soluble fiber in it unlike wine, which doesn’t come with any fiber at all. Fiber is very important for the intestinal transit. A beer in a day keeps you away from stress and heart attacks. Stress and anxiety can be reduced with the help of moderate alcohol consumption. The risk of dying of a heart attack and risk of strokes can also be reduced with the alcohol. 12 ounces/day is the “Moderate” consumption for women and 24 ounces/day for men. Moderate beer consumption could keep the bones strong. A positive link is defined by the researchers of Tufts University between the beer/wine consumption and hip-bone density. However, the same study says that heavy drinking could lead to bone loss, so be conservative. Everything has its own advantages and disadvantages. It depends upon the way you use that thing. So here are a few hidden disadvantages of beer that you didn’t know before. The law of averages doesn’t apply on drinking. One drink a day might help you enjoy a healthy life in the long run, but it doesn’t apply upon saving all those weekday drinks for weekend nights and consuming at once. It is known as binge drinking. Sharon C. Wilsnack, a professor of clinical neuroscience, says that it’s the riskiest pattern of consumption. Binge drinking means that more than five drinks are consummated in two hours. Such heavy drinks can affect your health badly. It increases the risk of having a stroke as the rate of high blood pressure is increased by this. So, as mentioned above that average use of thing can bring you benefits while the extensive use of it could harm your health badly. So be conservative and enjoy a happy and healthy life.